What’s known as the great fire of 1838 is recorded as having destroyed more than 1,000 buildings in the heart of Charleston, including most of those in what is now the city’s historic Ansonborough neighborhood. The 1846 residence at 50 Hasell Street is among the homes, churches and businesses that literally rose from the ashes within a decade. According to a history of the property published in the local newspaper, there was a dwelling on the property as early as 1779. After the fire, the owner had what amounted to a large vacant lot. The land that bordered on Anson and Hasell Streets was sold to a group of German businessmen who commissioned the construction of what now is St. Johannes Lutheran Church. The doors opened in 1842. A few years later the property adjoining the church caught the eye of a visiting planter, who built a 2-1/2 story home, raised on a full story basement and topped by a spacious attic. The first floor originally had a double parlor. Those rooms now function as a parlor and drawing room and may be separated by handsome pocket doors. The first floor now also includes a dining room, kitchen and powder room. The second floor has three bedrooms. Rooms on both floors were designed to open onto piazzas. A carriage house located in the rear of the property is thought to have once served as the kitchen outbuilding. While the carriage house can still be accessed from the parsonage garden, it now is connected to a church auxiliary building and primarily houses Sunday school classrooms. Other notable features include an ornate, cast iron fence, a Palladian window that looks onto the street and an eye-catching front entrance with etched glass inserts. 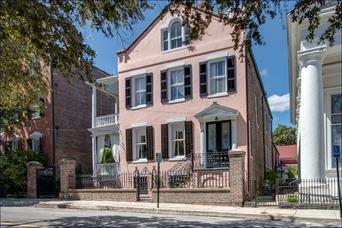 According to Historic Charleston Foundation experts, the architectural style is transitional Italianate. The grand home was first sold in 1853 and purchased by St. Johannes in 1919. Since then, The Parsonage in Charleston has been home to a relatively small number of families, primarily due to one pastor’s 37-year service. By 2014, the years definitely had taken their toll. The last pastor in residence departed in 2006. His successor, who later retired, owned a nearby home. After years of dispute over whether to restore or sell, the congregation unanimously agreed late last year to borrow the funds to bring the property back to life. The restoration included much-needed interior and exterior work, including the creation of an English-style garden. The work began paying dividends almost as soon as it began. For example, more than 20 layers of paint weighing more than 200 pounds was painstakingly removed revealing beautifully detailed woodwork and a solid mahogany stair rail. This historic property is now ready to resume its role as a vibrant part of the life of the St. Johannes congregation and as a beautiful, welcoming community asset.